Back in 1991, an emerging hip-hop group busted out of the New York scene and made its way throughout, not only the rap world, but college campuses across the country. 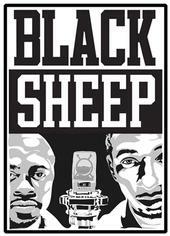 Black Sheep's A Wolf in Sheep's Clothing, and the lead single "The Choice is Yours," was one of the most innovative hip-hop albums of the time, earning them props alongside A Tribe Called Quest and Jungle Brothers. But when it came time for the second release, Black Sheep was more or less black balled. But now Dres and Mister Lawnge (aka Andre Titus and William McLean) are set to drop 8WM/NOVAKANE on Oct. 24 and just put out the digital-only single, "WhoDat?" that can hold its own against any recent track by Kanye. The lyrical content, while peppered with a few too many "niggas," flows effortlessly, backed by a steady stream of horns and up-tempo beats that will likely make this a huge club hit. Where they were skilled MCs back in the day, 15 years on life has treated Black Sheep well and their strength on the mic definitely shows. Black Sheep! Very cool. "Engine engine number 9/On the New York Transit line/If the train should jump the track/Pick it up. Pick it up! PICK IT UP!"